We have been busy with visitors the last few weeks and have been on the go. I have many photos and fun things to do if you have a chance to visit Austin, TX. Austin is a great weekend destination, a stop during your vacation or a destination onto itself. This will take a few blogs but each day I’ll try to update you on one of the activities. 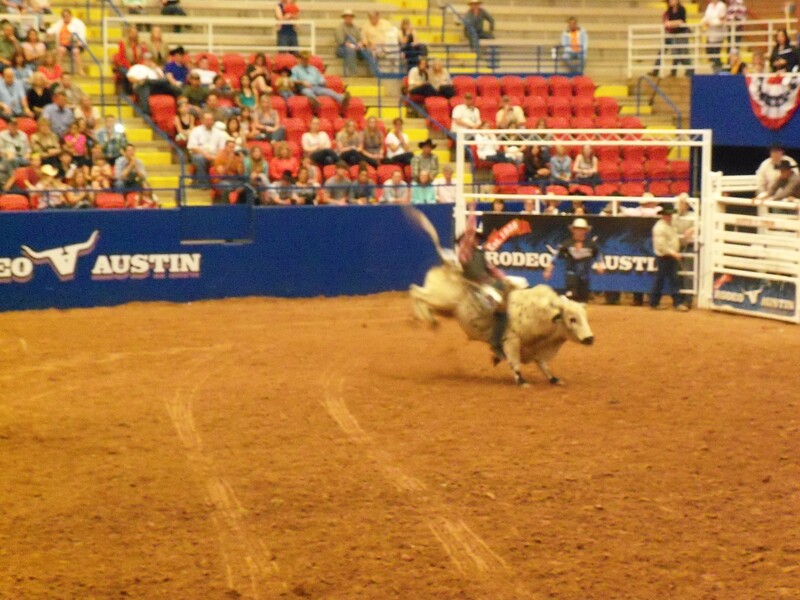 Today’s photos are from the Austin Rodeo. 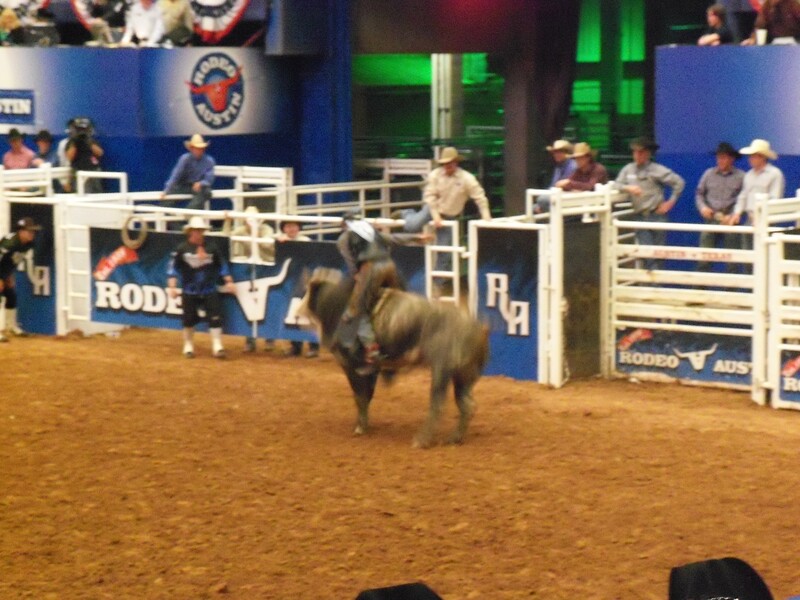 The rodeo is not a year round activity but approximately the middle two weeks of March. If you plan on being in this area during the month of March, then I would certainly consider looking this up and plan on having a fun evening. My best description of Austin’s rodeo is that it’s in a good location, out of city traffic, and the grounds themselves is like the size of a County Fair. They have a stage outside for musical entertainment, about every 2 hours there was a new act. Plenty of “Fair” food, and some shows periodically thru the day. Of course there was the amusement park rides, but we passed on that section. They had pig races, a “roper” who was very good, a western shootout, and a dog show in the afternoon. The day we went to the Rodeo, the Rodeo started at 7PM. 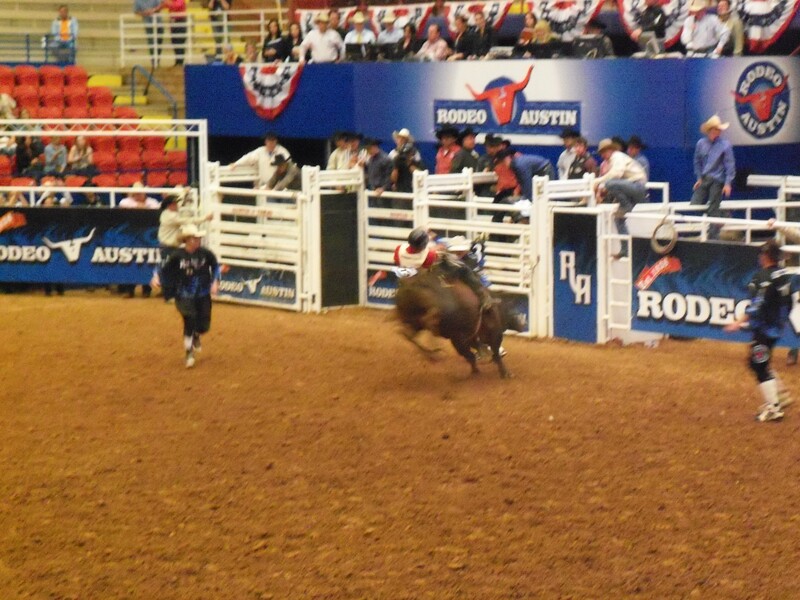 It had all the standard Rodeo things – roping, barrel racing, bronc riding and bull riding. We went on a Monday evening so the stadium was only about half full, but it was still fun and enjoyable. I forgot to mention they also have animal judging, cows, pigs, etc… just like at County and State Fairs. So here are some photos. I will mention that some might be a little fuzzy as these are the “action” shots. 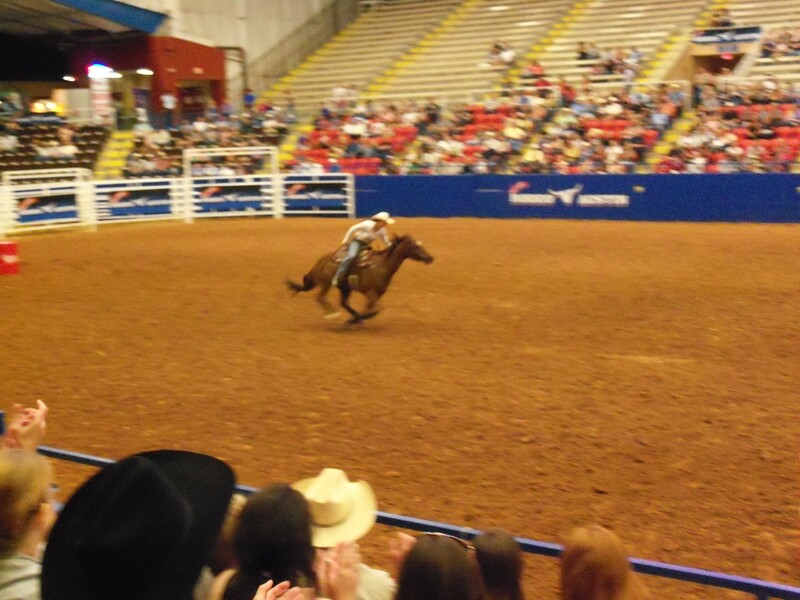 If you haven’t been to a Rodeo, I think it’s a good American past time and you should try it at least once – have fun! I think all ages would enjoy this activity. It’s not an all day activity, but if you can arrive a few hours before the rodeo starts you can take in the shows, possibly see some judging, have a fun dinner, then attend the rodeo. 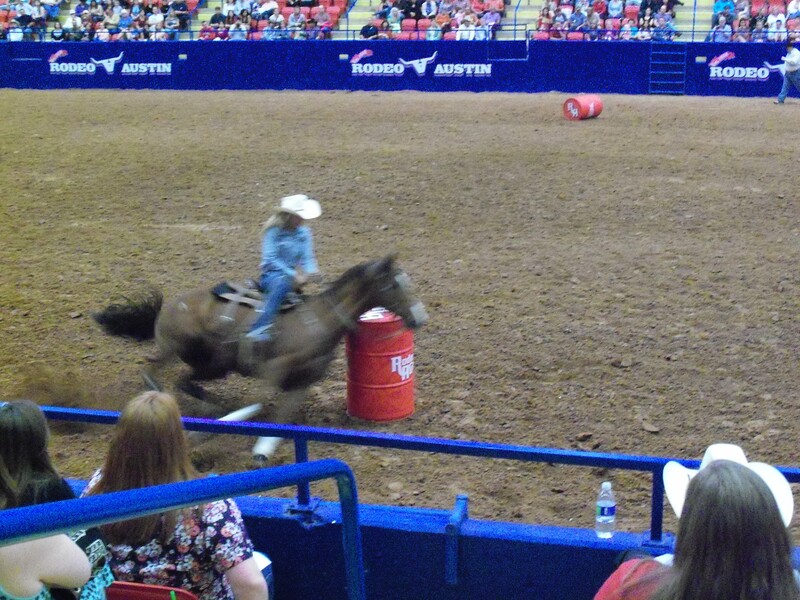 Also, after each rodeo event there is Live music to enjoy. So when next March rolls around and you’re going to be here, take a look at their website, and book your tickets. Hope you enjoy. In yesterday’s post I talked about the Parade and my items I displayed at the County Fair in the Antiques and Heirlooms Exhibit Hall. I was disappointed that of the 4 items I submitted I had won nothing, zilch, nada! I also talked about me being a “middler” my entire life. I now must make a correction to this post. I picked up my items last night from the Fair and am extremely happy to report I WON A FIRST PLACE RIBBON! Yes, I have a first place ribbon. I have broken the streak. I won First Place. It took a hell of a long time, and I’m going to take my 2 minutes to say again I WON FIRST PLACE! Do you detect I’m happy about this, yes I am! I might be old and gray, but there are some things no matter what age you are that still can be exciting. And when you have been a “middler” most of your life you want to shout from the highest roof “I WON FIRST PLACE”. OK, enough is enough. It’s out of my system, but I will tell you I finally understand the excitement of getting that first place ribbon. Once you get it, you want more. Can’t wait until next Fair season, I’m already thinking what I can submit. The next step is to get a trophy (they’re the best) so I’m going to rummage thru my stuff I have tucked away to see if there are any surprises that I can find that’s going to help me get that trophy. 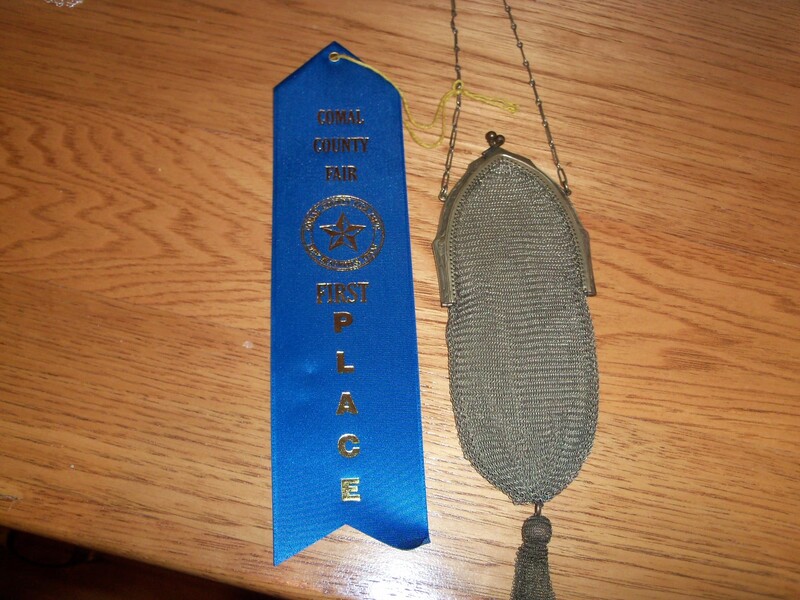 I won my first place ribbon for my Grandmother’s mesh purse from around 1920. My Mom saved this for me. What’s special about this and every item that she gave me is that she wrote notes for everything and so when I look back at these items I read my Mom’s hand written note which tells me about the item. Of course when I was younger I thought that quite strange, but now that she is gone, I really appreciate the time she took and the memory it gives me. It’s funny after so many years I can still look at the hand writing and say “yep that’s Mom’s”. 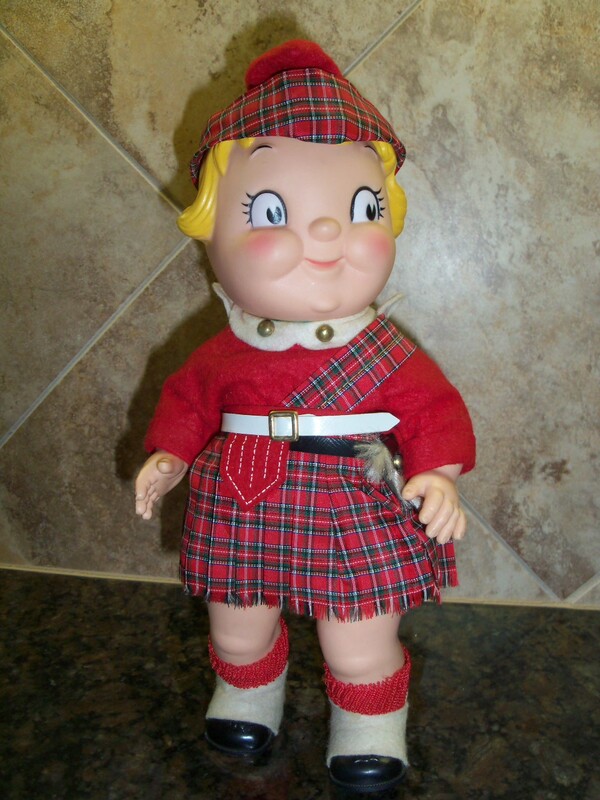 The other item I submitted was a Campbell Soup Doll from the late 50’s. When I unwrapped the doll I was amazed at how good the condition it. This was prominently displayed in the case, but it didn’t win anything. Don’t understand why, it is so cute. The last two items were also given to me by my Mom and these items were hers and my Grandmothers. The curling iron dates back to 1934. My Mom wrote “My Dad used to curl my hair for Sunday Church and special occasions. Heat in flame on gas stove – test for low heat on newspaper”. 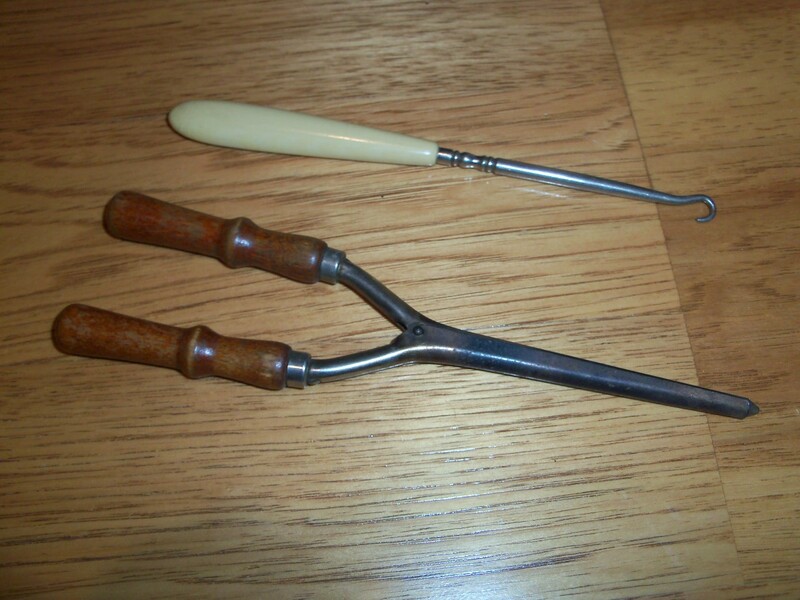 and the last item was a button hook with an ivory handle dating back to the 1920’s that my Grandmother used to lace her Hi-Button boots or dresses with lots of little buttons. Curling iron from 1934 and button hook from the 1920’s. It was fun to go back down a road that hasn’t been traveled for a long time. For years and years these items have been wrapped up, but I realize now that’s just a waste. Although the ribbon was nice, the most important thing I received from this travel is that these items need to be displayed in my home so I remember my family, but also to be enjoyed by people who visit. So from now on, these items will never be wrapped again. 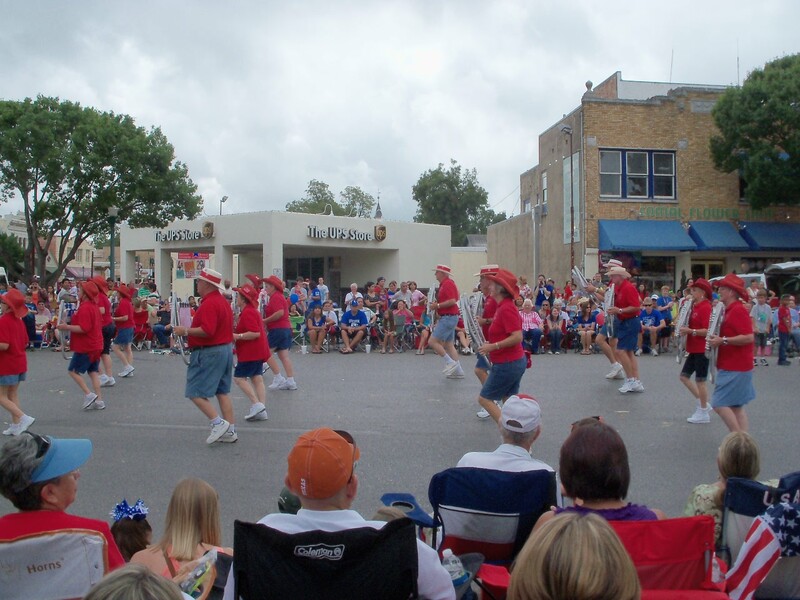 The Lawnchair group – local parades at their best! One of the High School Bands. They were at the front of the parade, they didn’t get wet! 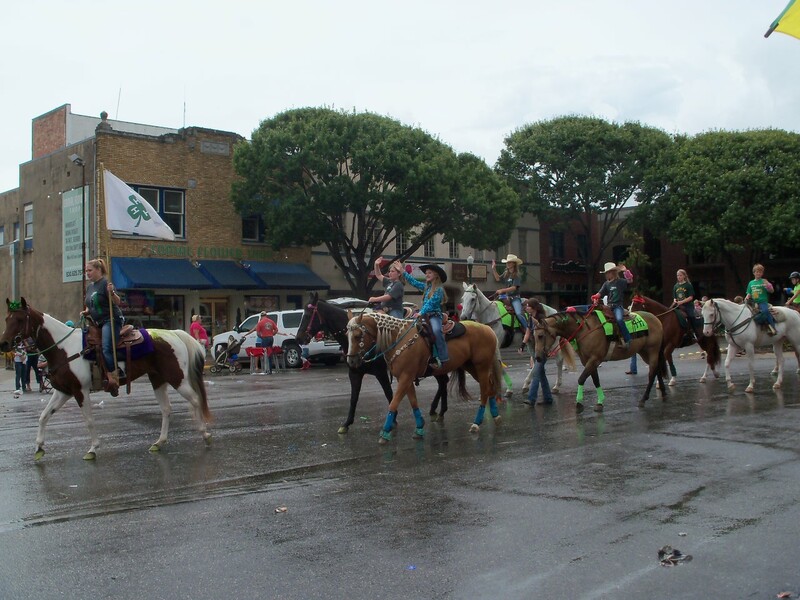 What’s a parade without horses. 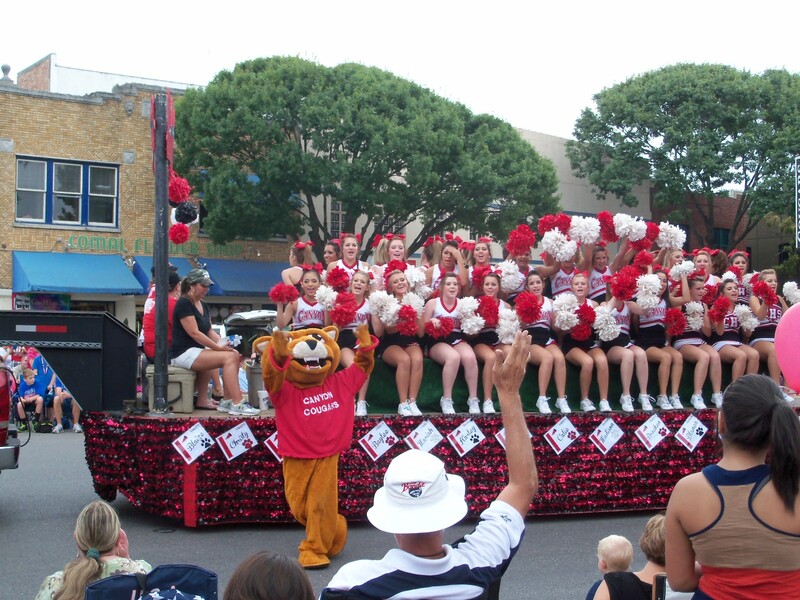 A must for every local parade – High School Cheerleaders, and don’t forget the Mascot! Couldn’t have picked a better spot – this band stopped right in front of us. Hope you enjoyed the parade! 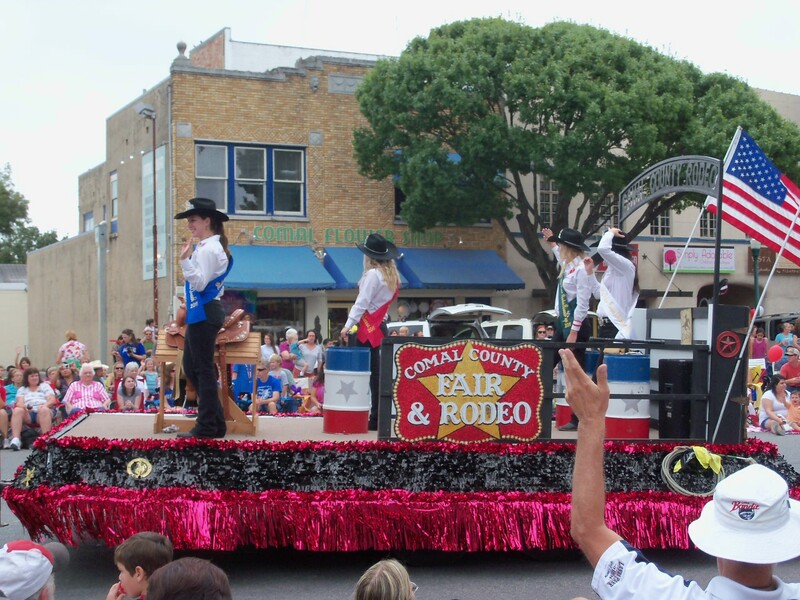 As mentioned last post we were going to watch the County Fair Parade that is a much celebrated local event. So celebrated that all County schools and government offices and many local businesses close for the day. We also heard that the parade was 2-1/2 hours long. 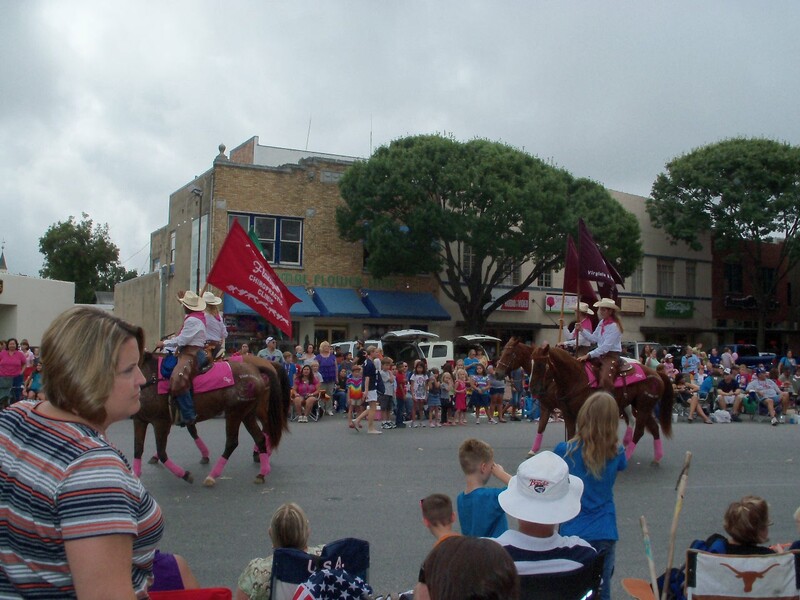 The Rose Parade, I think, is about 2-1/2 hours long, so how can a local small town parade be 2-1/2 hours long? Let me confirm that it was 2-1/2 hours long. They filled this 2-1/2 hours with the 4 County High School bands and all associated cheerleading squads, and anyone that could possibly be associated with the band or sports. I was amazed at how large these bands are. We sat in a very good spot so when they stopped to play they stopped right in front of us. There was every little league football team, cheerleading team, and soccer team that exists in the County. Every elected official and a representative from every police and fire department from every town in the County. I have always wondered do these Officers that are in the parade, do they volunteer, is it random, or is it rotated so everyone gets a turn. It seems like some really enjoy it and are waving and others look like they really don’t want to be there, I guess I need to ask somtime. It was an extremely humid day, thankful that it was cloudy, otherwise it would have been unbearable. I really felt bad for the kids in the Mascot uniforms. We made it 2 hours into the parade and it started raining. We thought it was just going to be a drizzle, but then the skies opened up. People packed up and ran, we stood under a very large tree (no lighting) and although many went for cover, the hardy moved their chairs from the back row to the empty front row. You could tell the real true parade watchers, they were prepared with their rain slickers and they just sat there. The rain did stop and we finished watching the last 15 minutes. We also moved from the back row to the first row as the parade route had thinned out quite a lot. I felt bad for the kids at the end of the parade as there weren’t many people left, that is why I wanted to stay. Coming from a large city I never experienced any of these small town activities so when our town celebrates with these special events I feel very strongly that we should support these as best we can. 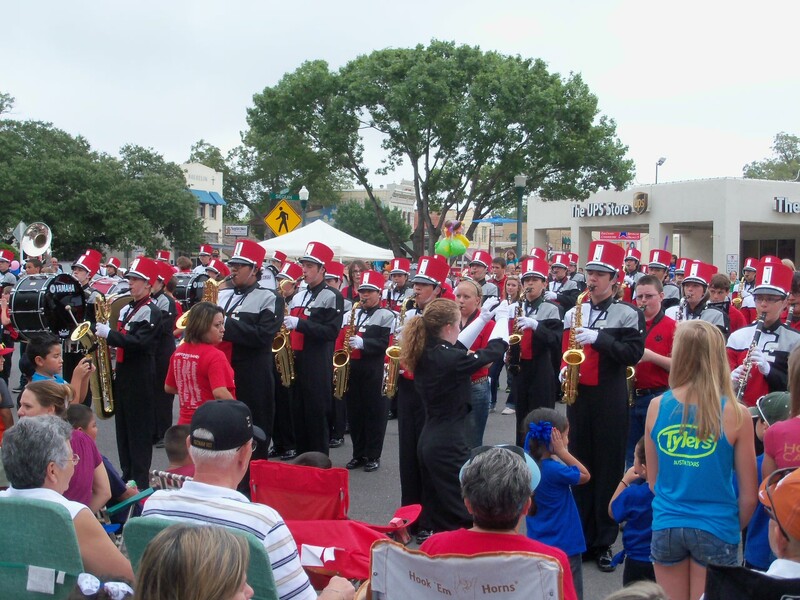 We have been to the 4th of July parade and now the Fair parade, I am glad we were able to attend. Having a full time job I never took a day off to do things like this so although not a major event, it was a “to do” on my list and I’m glad we took the time to attend. It’s really great to see the kids enjoying this parade and taking the time for preparation and attending. Some kids probably think this is a stupid thing to do, but I’m glad there are many that are still holding the tradition together. 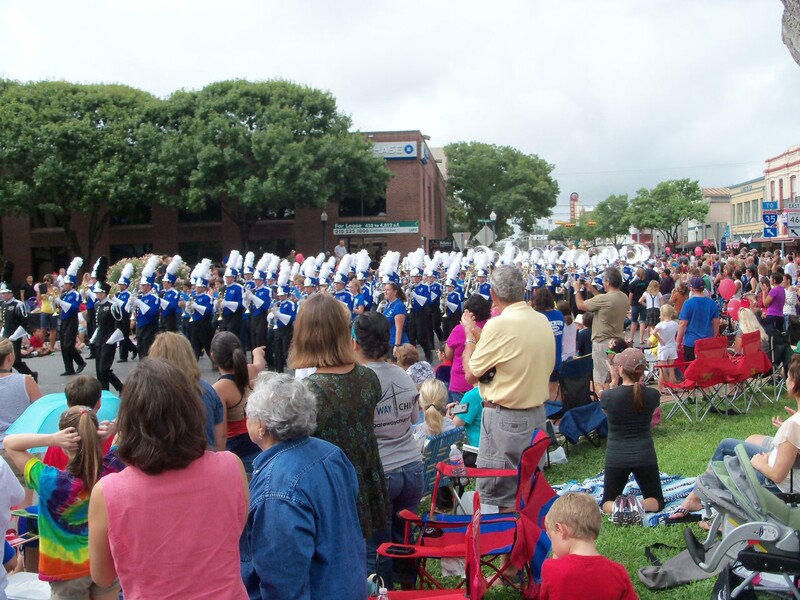 So as the parade faded into the distance we decided we had two priorities – eat lunch and a bathroom stop. It had been a long morning and we were hoping to get to our fast food destination quickly, that was wishful thinking. It took us 45 minutes to get to our destination. There were traffic jams everywhere and quickly the euforia experienced watching the parade evaporated waiting in backups that I didn’t think were possible in our town. Finally we made lunch then off to the Fair. Because I was an Exhibitor (I always wanted to say that) we received free admission. What would you expect when there is no school, the parade is over, where do you think the town went to, well of course the Fair. It was packed! But we found a place to park, and once inside most of the kids were in the Amusement Ride section, which we avoid, so wasn’t as crowded as we expected. We watched some sheep that were being judged, I find that very interesting, but have no clue why the ones that are first win. I always think the cows are so pretty, I have the urge to want to pet them. After looking at the animals and watching the judging, off to the exhibtor buildings we went. I do have to say that I had high hopes of winning something, but I have to be honest and say I didn’t win nothing, zlich, nada. I could lie and say I wasn’t disappointed, but I was. I consider myself a “middler”. Science fairs at school, being picked for a team, even playing bunco, I’m a middler. I’m never the top 3, but always in the middle. I guess that’s OK, and I should be happy I was never last, but you know when you’re a “middler”, it would be nice once in your life to come in first in some contest, no matter how silly. I say I’m not competetive but I think I’ve become that way because it’s easier to accept the middle. But what I will say is that it was fun seeing my stuff I brought to the Fair on display. It was fun knowing that things that my Mom had as a child, or she collected were on display for all to see, it felt good. Better than being wrapped up in some drawer. I think she would have been proud that I did this with her things. So in one day I did two things on my “to do” list, attended the County Fair Parade and had items on display at the County Fair. It was a good day, and fun traveling down this road. Until next week, take care, have fun traveling down your road and remember to have fun! At one time in our life’s we probably have all gone to either a County Fair or a State Fair. As a child I remember every August my family going to the Wisconsin State Fair. We lived in Illinois, but because we lived close to the Wisconsin border it was much easier for us to go to Milwaukee, WI then to drive to Springfield, IL, which would have required an overnight stay, so to Wisconsin we went. I remember the smells, sights, and sounds of the Fair – the fried foods, the animals, the exhibits, and the amusement ride area. Being a city girl it was my one time of year that I enjoyed walking around all the animals. I remember how beautiful some of the Rabbits were, and the cows; how the kids took care of their animals with such love that I wondered how they could ever sell them. It was a lifestyle that I could not relate to, but was fun to see once a year. We ate all the wrong foods that day, anything that was fried, cotton candy, and popcorn and of course you can’t go to a Midwest Fair without corn on the cob. I remember the beer tents as that was my Dads favorite spot. He wasn’t into the animals so my Mom was the one who usually took my brother and me around to see the animals. We weren’t too fond of the pigs, but were always amazed at how big some of them were, and pretty in their own way. We didn’t ride too many amusement rides, as my brother and I usually got sick, but we did enjoy one ride on the Tilt-A-Whirl, that usually was enough to hold us for the day. It was an all day event. We left early in the morning and didn’t get back until late in the evening. We were exhausted with all the things to see and do because as we know a State Fair is quite big and you need to cover a lot of ground to see everything. We went to the State Fair for many years, so as I grew older what interested me when I was younger changed over the years, but something new always caught my attention, so a Fair is good no matter what age you are. So if you haven’t been to one, I think you might enjoy the experience. Well, as an adult we really haven’t been to any State Fairs as we are not close to where they are held so we have been attending our local County Fair. On a scale of 1 to 10 with the State Fair being a 10, I consider most County Fairs about a 3. They are very small on scale, but basically have the same things, just extremely downsized. They have the food, animals, tractor pulls, displays and now as an adult the beer tent! They usually have good music in the evenings. So recently we have been going to our County Fair and it’s been a nice evening out. 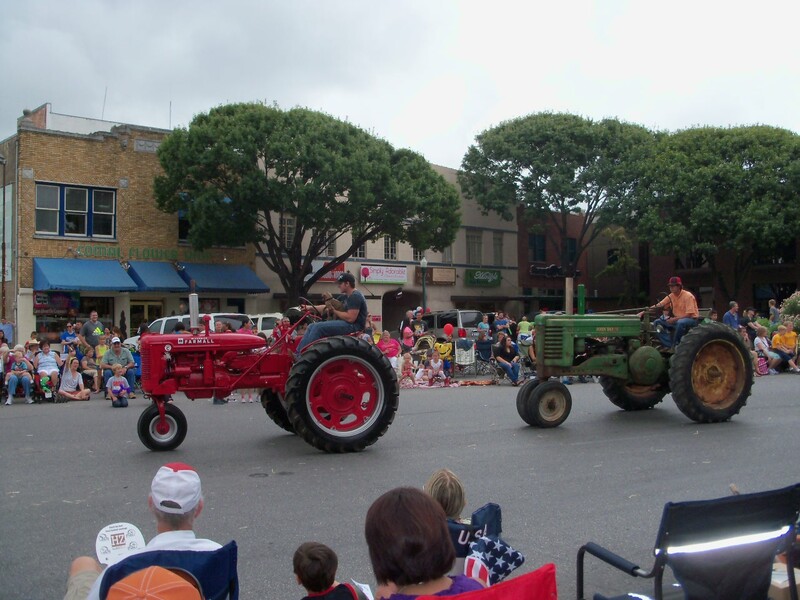 In addition to the Fair, the County Fair parade is this Friday, one of those things I have never been able to attend as I have always worked. So we will be at the parade on Friday and I’ll let you know how it is. Until then I went down a new road and I’m excited as a kid, it’s a good feeling. Until next time, enjoy your travels.